There are many types of toilets to choose from in today's market. Buying the wrong toilet for your bathroom can be costly, since you can end up with high plumber bills, re-stocking fees and high water bills. 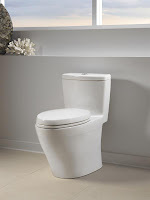 The most important factors to consider when selecting the appropriate toilet for your bathroom include: Rough-in Dimension, Bowl Size, Configuration, Flushing System, Height, Color and Design. The first thing to consider is the toilet's rough-in dimension, which measures the distance from the finished wall to the center of the sewer drain for the toilet. 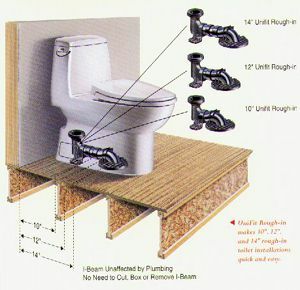 Determine whether your toilet is 10", 12", or 14" rough-in. 12" rough-in is the most popular size in United Estates. Next big thing is bowl size. Most people find elongated toilet bowls to be more comfortable, but in a small bathroom, a round bowl can save space. 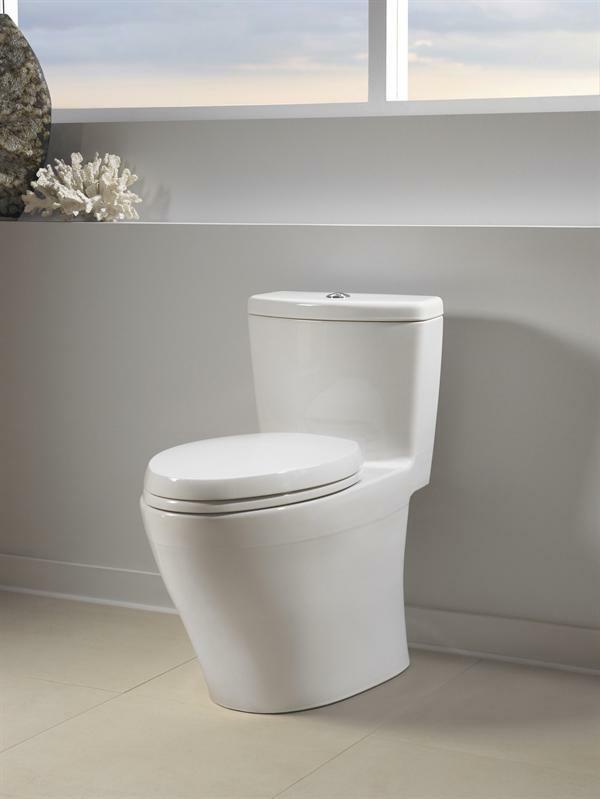 Elongated toilet bowls measure up to 31" from the wall, while round fixtures max out at 28". Comfort also comes into play with toilet seat rim heights. Many manufacturers now offer toilets that measure a few inches taller than standard 15" fixtures. There are several toilet types available. A two-piece toilet, in which the tank bolts on top of the bowl, is typically the least expensive option. A one-piece toilet, with an integral tank and bowl, can cost more, but these units are easier to clean because they have no seam. Wall-mounted toilets add drama to a bathroom, and cleaning under them is a breeze. However, this higher-end fixture can be more expensive to install because it requires a thicker wall to mount the toilet and house the tank, and future maintenance could require reopening the wall. The flush valve is the opening at the bottom of the toilet tank and controls the flow of water to the toilet bowl when the toilet is flushed. Overall, the larger the flush valve the better the flush performance will be (a 3 inch flush valve is considered very efficient). The diameter of the trap-way is another important factor. 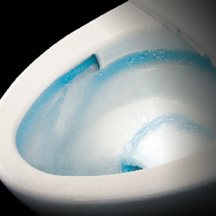 The trap-way allows waste to easily pass out of the toilet bowl. In general, the larger the trap the better (a good trap-way size is around 2-1/8 inches). Water consumption is also very important. 1.6 gallon-per-flush is the universal rule of thumb when it comes to water usage. However, most companies like TOTO have decreased the water amount to 1.28 GPF. The vast majority of TOTO toilets are environmental friendly and do not compromise flushing abilities. In fact they are ranked at the very top in flushing efficiency with their new technology called Double Cyclone. The average height on most toilets is between 14 to 15 inches to the top of the bowl. However, most new toilet models are coming in "comfort" or "ADA" height (16.5 inches and above). The higher seat makes it more comfortable to seat on the toilet and is a must for people that have difficulty standing up or suffer from knee injuries. Make sure you get a toilet that matches with the other porcelain fixtures in the bathroom (tub, sink, vanity counter top, tile, etc). this is especially important if the toilet is next to one of this fixtures. Also, check that your new toilet design will pair up well with the overall feel of the finished bathroom (modern, contemporary, transitional or traditional). Bathroom is a very important part of our daily life. So we need to buy this with care.Thanks for this informative post. Thanks for the tips. It's not easy to choose the bathroom and find the right vanities. I've recently reformed my bathroom and I changed my bath for a shower, and we gained a lot of space. I like the wall mounted toilet, but maybe if you need to fix it in the future, it could be difficult to get to the problem.